New Year, New Home! 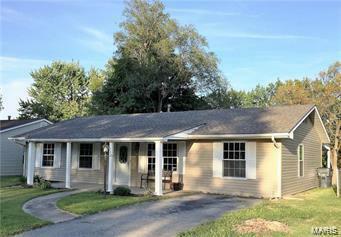 Get your piece of the American pie with the terrific, well maintained ranch with lots of space! Large living room is bright and open with easy to maintain wood veneer flooring flowing throughout home! Freshly remodeled a few years ago, this home is move-in ready! Large, eat-in kitchen with lots of cabinetry and counterspace with appliances to stay, including brand new garbage disposal and water heater replaced in '18. Huge family room with brick fireplace can be a terrific space to enjoy and entertain. 4 bedrooms and two full baths make for a wonderful space plus a large, fenced backyard with patio. Covered porch can be enjoyed just hanging out with neighbors. Some new windows and sewer line in '17. Hurry in to claim this beauty; occupancy inspection passed. Convenient to shopping, schools and entertainment.